You can't pore over auction records and price guides to find values for your silver and silver plated antiques if you don't know exactly what you have, including when and where it was produced along with who made it. Easier said than done when some symbols on antique and collectible silver can be thoroughly confusing without resources to point you in the right direction. Scouring online resources offers a wealth of information on sterling silver and silver plated wares to assist you in your research tasks. But, to be honest, some are much better than others. Use this guide to discover some of the favorite spots where those in the know go online. You will learn to understand and research silver origins, craftsmen, and manufacturers using hallmarks, along with a few online value guides to help you with that daunting task as well. There are many different grades of silver, and even antique items that look like silver (such as German silver, nickel silver, and alpaca) but are not at all what they appear to be. This guide will help you decipher the basic marks associated with silver and understand exactly what they mean. This is a very popular site highly recommended by avid collectors and antique dealers alike. It has an extensive database helpful for researching silver marks, hallmarks, trademarks and maker's marks on old silver from around the world, especially those used on vintage and antique sterling along with coin silver. Also has a section of silver plate marks, which can sometimes be even more obscure and harder to identify than sterling silver maker's marks. If you're sure your piece is American made, this is a great place to start your research. This collection of American manufacturers and retailers of sterling silver, coin silver, and silver plate marks are listed alphabetically by manufacturer. While the information here isn't as extensive as that held in the guides mentioned above, it is a very useful introduction to silver hallmarks used on antique and vintage jewelry from around the globe. Anyone getting started buying or selling silver jewelry will find this information to be useful and a great point of departure for learning even more on the topic. Need to identify your grandmother's silverware pattern or one you picked up at an estate sale? 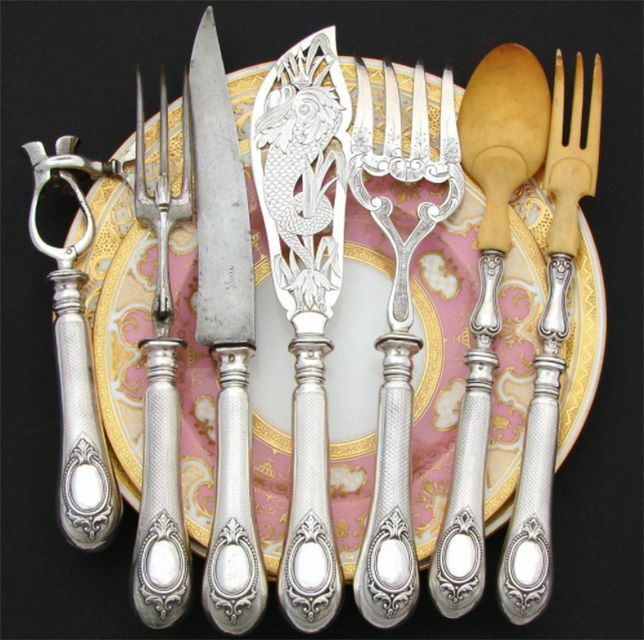 This site offers a great starting point for researching antique flatware and serving pieces in sterling silver made by Gorham Whiting, Towle, Dominick & Haff, Reed and Barton, R. Blackinton & Co., Tiffany, Unger Bros. and Wallace. SilverCollect.org's silver plate flatware pattern guide is also a great resource for collectors and dealers alike. Stainless flatware patterns are also available on this site. Use these illustrated online price guides to help you identify and value sterling silver antiques, silver plated collectible wares, and vintage sterling silver jewelry. These resources are compiled and updated using completed auction results and documented selling prices gleaned from various resources. Although this reference is through a genealogy Web site, it serves as an aid in identifying the work of various silversmiths who marked their wares with initials only. The marks are grouped alphabetically by first letter and each is hyperlinked to the maker's pedigree page, if you want to learn more about the lineage. The marks on silver made in other countries often use symbols that can be quite confusing until you decipher what they mean. Use this site to help you decode English, Irish, and Scottish Silver mark examples. This is also good reading if you're just beginning to research a silver piece and you're not quite sure of its origin. A good resource for researching antique and discontinued silverplate flatware and serving piece patterns made by manufacturers such as 1847 Rogers Bros., Community Plate, Oneida, Wm. Rogers, Wm. A. Rogers, Holmes & Edwards, 1881 Rogers along with others. See above for SilverCollect.org's sterling silver flatware pattern guide. Stainless flatware patterns are also available on this site.